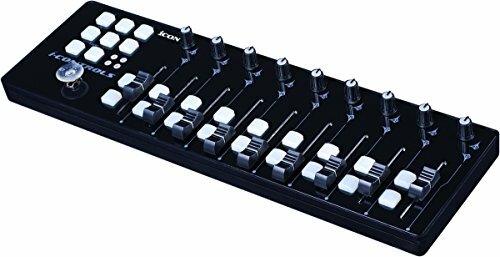 The Icon I-Controls is a slim and compact mixing controller. It features nine faders, 18 buttons, nine encoders, an X/Y joystick, six transport buttons, and two modifier buttons for multiple layers of control. The I-Controls comes bundled with Amplitude and includes factory presets for most popular DAW’s including Cubase, Nuendo, Logic Pro, Pro Tools, Ableton Live and Studio One. Every control can be custom-mapped to any MIDI application using the included iMap software. The I-Controls uses Mackie Control and HUI protocols for presets and automatic mapping, and can be configured for general MIDI values as well. The I-Controls is designed for portability. It is USB bus-powered and fits in most 15″ laptop backpacks. USB in and out ports are provided to chain other Icon I-Series devices. If you have any questions about this product by Icon Pro Audio, contact us by completing and submitting the form below. If you are looking for a specif part number, please include it with your message.